A few weeks ago I claimed that when I was a kid, the best part of my school day was when it ended. That was because I knew when I got home my mom would have an after-school snack waiting for me. What I didn't say was that the second best part of my school day was lunchtime. I was lucky since I never ate in a school cafeteria. There were no soggy bologna and cheese sandwiches for me. Instead when I opened my lunch box, something delicious made by my mom was waiting for me. Come to think of it, I was truly fortunate. One of my mom's keys to making healthy and delicious lunches was to buy food in bulk. Then she would plan ahead: most Sundays she would bake extra chicken cutlets or make a huge vat of vegetable soup that could be used for our lunches all week long. Of course we did get the occasional ham and cheese or pastrami sandwich, but never bologna. Blegh. And though most days we got a sweet treat like a cookie, Mom made sure that every day included fresh fruit that we liked. Because really have you ever seen a child actually eat one of those sad, mushy red delicious apples that comes on their school lunch tray? So even though I don't have little ones to make lunch for, I still think providing children with healthy and flavorful lunches is important. That's why I'm submitting my healthy chili to Leena of Leena Eats who is hosting "Fresh Voices for Fresh Choices: A healthier school lunch, one story at a time." Leena has joined the Healthy Schools Campaign in an effort to "give our kids fresh, healthy food at school and a chance to be active during the day." Like most kids, I still love not-necessarily-good-for-you-food like pizza, macaroni and cheese, and chili. However, with a little tweaking, you can reduce the fat and calories in these dishes and pump up the nutrition. My Healthy Chili is made with extra lean hamburger (84% or 92% works well) and is chock-full of nutritious veggies like zucchini, red bell pepper, beans, and tomatoes. It's made with lean protein, which is necessary for building muscle and bones; it's high in vitamin A, which helps maintain ocular health, vitamin C, which helps the body heal more quickly, and lycopene, a carotinoid associated with a lower risk of cancer. Plus it's rich in fiber, which is important for promoting digestive health as well as lowering the risk for high blood pressure and heart disease. And if that isn't enough to convince you, then just eat it because it's delicious. My older brother and his wife have been making this chili for their lunches, and the last time I spoke with him, he said, "We can't stop eating that chili! It's sooo good." It's amazing what a little cinnamon can do. If you'd like to get involved and help support school wellness programs, then visit www.healthyschoolscampaign.org/childnutrition to learn how and to sign the petition. Because all children deserve a lunch that tastes good and is good for them. 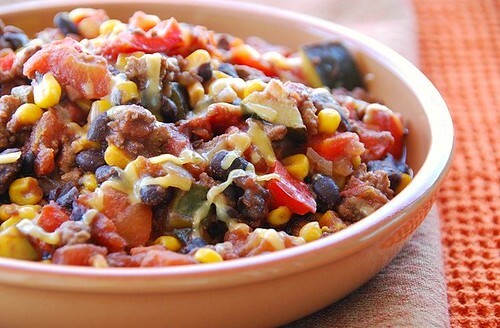 This healthy chili is made with extra lean hamburger and is packed with good-for-you veggies. Enjoy it on its own, or serve it with baked tortilla chips or warm whole wheat tortillas. In a large pot over medium-high heat, warm canola oil. Add onions and saute until translucent and lightly browned, about 5 minutes. Add ground hamburger and saute until lightly browned, about 8-10 minutes. Add red bell pepper and zucchini and cook for 5 minutes. Add corn, beans, tomatoes, water, and brown sugar; stir well. Add fajita spice, cumin, cayenne, and cinnamon; stir well. Reduce heat to low; partially cover and simmer for 20-25 minutes, or until thick and soupy. Cook longer if you like your vegetables softer. If desired, sprinkle with a little cheddar cheese and fresh cilantro before serving. *Note: I use 1/2 cup water for a thicker chili, but use as much or as little as you wish to achieve desired level of soupiness. **If your child doesn't like too much heat, then simply reduce or eliminate the cayenne pepper. I have never ever had chillie, i have heard of them so much but till now not cookesd them. I am with your mom. I always make soup for threedays and keep them in tuperware in the fridge. Sometimes i make them in bult and freeze them in portions. One way of making my daughter eat vegetables when she was little was to make soup. What a great mom to send you to school with such amazing lunches! My mom tried sending us with similar things, but would get so frustrated because we would always throw the thermoses away or leave them in our classrooms over the weekend. Yuk! I make a similar chili and I love it! It is so good and good for you! This is perfect for winter too! great dish and healthy too. What can i ask for more ??? Great mum !!! So true about those sad, mushy apples that are rotting in land fills all over the country. Ditto for those little boxes of Sun Maid Raisins that make moms think they are providing a nutritious lunch. I think more are tossed than consumed. This chilli looks like it's destined to fill happy tummies (not trash bins). And thanks for the petition link too. Darn... just when I thought I had my chili recipe down, this one looks too good not to try! Does it freeze well, by any chance? Might be perfect to make a batch this weekend to have on hand for Christmas visitors. Great post, Susan. I will definitely have to add this to my arsenal of chili recipes. Thanks for helping out and signing the petition! The picture of the chili with all those bright colors just looks so inviting and healthy. I can't comment on kids' lunches (I was never that successful in getting my son to eat what I packed him for lunch) but for my lunch, this would be perfect. 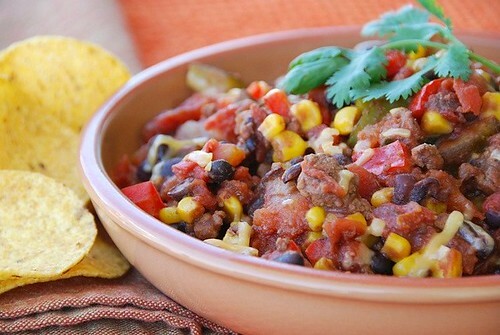 This chili is so thick, it looks like it would be good as a dip with tortilla chips, too! Healthy, colorful and tasty! Impossible to go wrong with such a great dish! I love how you take these classic rich dishes and make them so healthy. Delicious looking chili! Thanks for sharing the recipe! I'm always looking for delicious and healthy ideas for my boys lunches. Gonna have to work on them with chili though... they won't touch it for some reason! Soups are always a hit with them though. Now that is what I call Chili. Looks so tasty. I don't have kids but feel very passionate about changing the way kids eat! Probably because I too always had a lunch made by mom! I wish I knew how to contribute more to this cause so I'm going to check out all those links :-) Thanks! As for chili, there's no reason to NOT add veggies. Yours looks great! Yum!!!!!!! And healthy to boot. You rule! This looks great Susan! I love the addition of the brown sugar. I'll have to give that a try the next time I make chili. All the veggies make it so colorful as well as nutritous! OMG, to be honest with you I never made any kind of Chili dish before. I heard so much about how good it is! I should really try it one day. Yours sounds very delectable! beautiful chili! it looks really tasty... and healthy :) and putting corn in anything... makes me want it! Forget healthy, I would dive into this mouth-first because it just. Looks. So. @#$@ing. GOOD! I used to volunteer at my daughters elementary school for their hot lunch program. They didn't always love everything on the menu such as ham and scalloped potatoes but the ladies really made an effort to have hot , nutitional meals on our kids plates. In fact I had to watch the lunch program menu to make sure I didn't amke the same things for dinner. 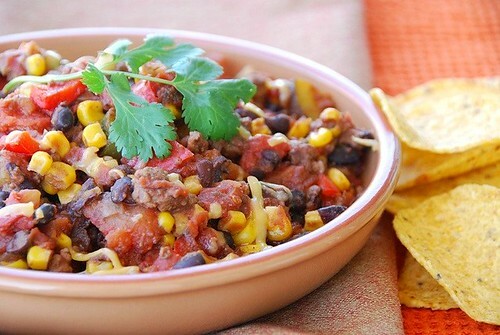 This chili looks so delicious and what's better... healthy! I loved it! Come to visit me at Chocorango! happycook-Freezing soup in portions is a great idea! I haven't done that. 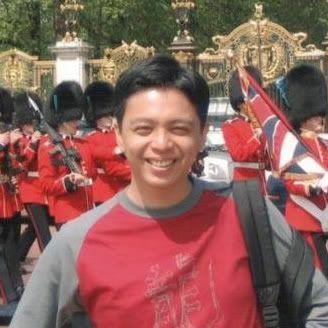 dhanggit-Welcome back! :) I'll look forward to your cookies. I remember your unique mango cookies from last year. rita-At least you'll have a chili recipe ready to go. ;) And it was my pleasure. kara-I don't freeze chili, but my mom used to. She recommends cooling it completely, then storing it in air-tight freezer proof containers. Then defrost in the fridge. Good luck! farida-I have fun doing it and am glad you like it. michelle-I'm so happy to hear you'll be checking it out. It's such an important cause for those with and without children. Thanks! elly-That little bit of sweetness goes a long way. I just love it. elra-You simply have to try it! val-But at least they were introducing kids to healthier meals, and over time, the kids usually start eating a wider variety of foods. So that's just wonderful! your chili looks amazing!! very hearty and filling! i can't wait to try your healthy tasty muffins!!! looks perfect for cold nights! i try to make a healthy version of chili for my brothers, too, as they are big lovers of chili. i make mine with ground turkey, and the rest just contains spices, vegetables, and beans! the spices make the biggest difference in the world! Very nice story... and delicious looking chili. I made yesterday white kidney beans with mango and raisins, I tried to recreate Heinz curry baked beans, he he... my favourite. That looks really tasty in addition to healthy! I remember the girls in the boarding school hostel at my high school getting white bread bologna sandwiches for lunch with a THICK layer of margarine and just feelign ill at the thought!! Great minds think alike - I also posted chilli over the festive season, although mine was a far simpler after-work-dinner affair. Will have to seek out black beans at the speciality section in our supermarket and why oh why don't I usually add corn? ?